If you want to create a comfortable leisure space near the swimming pool, building decking will be a good idea. Paving the decking is not only to improve the outlook but also to make the pool area be good for sunbathing, outdoor BBQ, a recreational place for guests. What material should be used in deck design? Generally, wood, composite material, tiles, stone or concrete can be used as materials for the deck of swimming pools, different material can obtain different function and effect. We recommend using WPC decking boards as your pool decking material, which is a very popular solution at present. 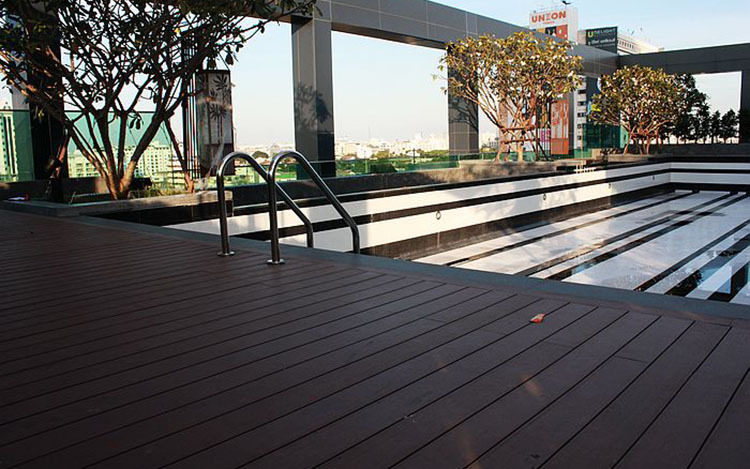 WPC decking boards are composite of plastic, polymer, and wood. It has higher strength compared with wood, not easy to crack, can better resist decay, it’s particularly suitable for a relatively humid environment like the swimming pool. No need to worry about spending the time to repair the decking every spring. Compared with ceramic tile, stone or concrete, and other hard materials, WPC decking boards are more comfortable, it’s anti-slip, and walking barefoot on the decking is also very comfortable. WPC decking boards can be cut and used, applicable for the round, square and other shape pools, including underground and ground swimming pools. On the ground decking, pool deck can also be used to build stairs. You can choose pool decking that matches the color of the house or simulate the appearance of the real wood to add atmosphere to your swimming pool and increase the practical value greatly. We also offer different sizes to meet the size of the swimming pool. It’s very simple and easy to install the WPC decking boards. Confirmed the design plan, install the joist frame, place and fix the decking boards, will only take few hours to complete.